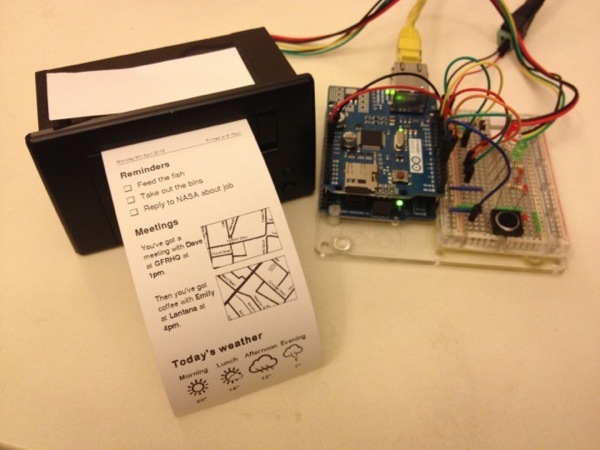 Wired – “Your Twitter Feed as Newspaper: A Look at the Tiny Printer Trend” « Adafruit Industries – Makers, hackers, artists, designers and engineers! You’d know thermal printers as the things that receipts come from. They work by selectively heating up parts of thermochromic paper. The parts that are warmed up turn black, the rest stay white. There’s a lot to recommend them: They don’t need ink; they are cheap to run; they’re fast, quiet, and reliable; it’s easy to replace the paper. This is why so many cash registers use them, along with shipping labellers, and undersea explorers.